Fly lines are vital piece of equipment. They are, after all, the weight that casts our flies to the fish that may or may not want to eat our “organized” piles of feathers and fur. I have fished with the Rio Gold fly line for the past 3.5 years. For those keen followers of YGF, you might have already thought to yourself, “Hey, wait a second BWO, you have been seriously fly fishing for 3.5 years.” So, I have. I will readily admit that the first two years, I couldn’t tell the difference between good and bad fly line. I am still somewhat of a beginner. But, now...now I can tell the difference. The Rio Gold fly line is a great general purpose fly line. In early spring, Rio provided me with a WF5F (weight forward - 5 weight - floating) line. I have fished it all season. This year, I used the line on a variety of rods (most of which are not my own) including the Redington Pursuit (9ft 5 wt), Sage One (9ft 5wt), Orvis Helios (9ft 5wt), and Hardy Sintrix Zenith (9ft 5wt). All of these rods are fast action fly rods. I have been able to comfortably throw and present small dries to rising trout, then turn around and throw big foam, streamers, or double nymph rigs. 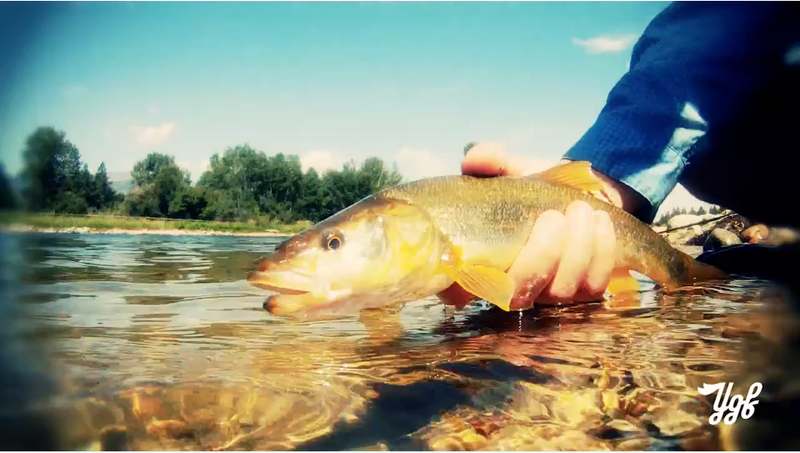 August in Montana is really the time when the RIO Gold demonstrates it’s versatility. Fishing tiny trico spinners in the morning, hopper-dropper rigs in the middle of the day, and streamers in the evening, the Rio Gold comfortably handles a variety of fishing situations. Pairing the Rio Gold with Rio's new Powerflex tapered leaders, I was comfortably and accurately fishing a variety of flies in a variety of situations. The Rio Gold WF5F line is 90 feet in length with a head measuring 47 feet. Simple math tells you that the running line is 43 feet in length. The front taper is 5’6” long, which is considered to be a mid-length front taper. The Rio Gold comes in two color combinations: Moss/Gold and Melon/Gray Dun. I chose the Moss/Gold color combination. With this color combination, the head is Moss green and the running line is Gold. Similarly with the Melon/Gray Dun combination, the head is Melon and the running line is Gray dun. The iteration of the Rio Gold fly line that I tested had the following features: XS Technology, Agent X Technology, SFT Technology, Dual Tone, Front-End Welded Loop, and Back-End Welded Loop. The newer version of the Rio Gold fly line has Rio’s new MaxCast and MaxFloat tip technologies. 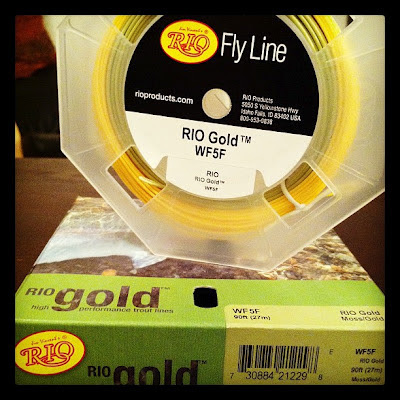 Rio offers the Gold fly line in six sizes (from WF3F up to WF8F). The front-end and back-end welded loops make changing leaders and/or reels/spools a breeze. For trout fishing, the welded loops have performed well and held up to the rigors of Montana’s waters. As I stated above, the Rio Gold is a great general purpose fly line. It more than handles small to large dry flies, double nymph rigs, and streamers. It performs well with casts from 15 feet to 70 feet. Who knows beyond 70 feet? Can you remember the last time you presented a fly to a trout more than 70 feet away? I can’t. It holds a stable loop if you can throw a nice loop. But, as with all great general purpose products, it is great at doing everything well...not great. Diehard nymph, dry fly, and streamer fisherman that will spend the whole day fishing one discipline should look towards other, more specialized fly lines. But, for those of us that fish to the ever changing conditions a typical day on the water presents, the Rio Gold is an excellent choice. I am an avid streamer fisherman. There have been times when throwing some larger streamers, I have experienced the dreaded big fly snap back that can send your streamer off target. That should be expected. It does not have the aggressive front taper of the Rio Coldwater Clouser, Rio Indicator, or Rio Grand lines. This line is billed to have a taper that allows a rod to load at close range. Found this too be true, especially with moderate to large dry flies, nymph rigs and streamers, however, with a fast action rod, sometimes the rod wouldn’t load completely when casting shorter distances between 15 and 20 feet. One can expect 200 to 300 hours of actual use with a modern fly line. If I do some quick, back of the envelope calculations, I fish, at minimum, one time a week (no matter the time of year). That’s at least 52 days on the water a year. During the summer, spring and fall, I will often fish 2 to 4 times a week (two full days and one or two partial days). Each season is 13 weeks. Assuming that I fish once a week during the winter (13 water days) and between 2 and 3 days a week (78 to 117 days) during the remaining seasons, I probably fish between 91 and 130 days a year (SIDE NOTE to parents and loved ones: I’m sorry, and also, I’m not...but, I also am...in addition i wish that was figure was more like 200 to 300 times a year...so......). Assuming an average of a 6 hour outing (accounting for partial days and shorter winter days) with about 3 hours of actual use of the fly line, I spend approximately 273 to 390 hours of my year actually using fly line. 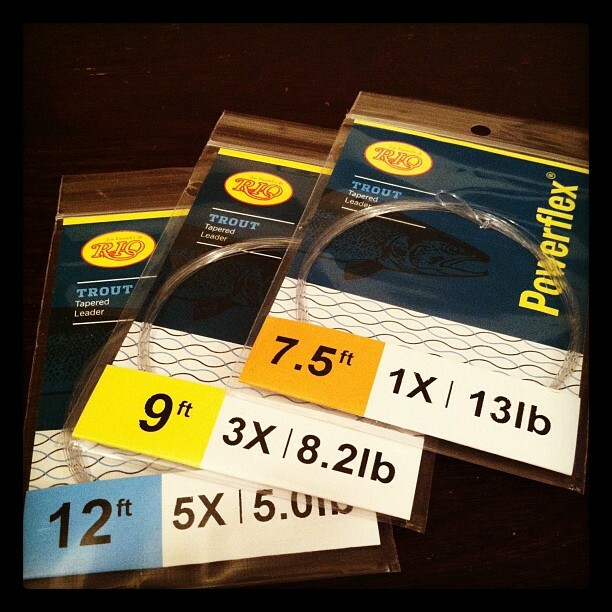 So, a fly line should last me a little less than a year. It should also be mentioned that I have terrible fly line management. Always stepping on it. Tangling it. So, the lifetime of the average line is mostly likely reduced when I use it. Also, I am poor. I try to get as much use out of my fly lines as possible. In the past, towards the end of the season (after 80 plus days on the water) the welded loop has started to fall apart at times. Additionally, the head of the line starts to sink at the end of the season. But, that is after more than 300 hours of use. During the first 300 hours (or so) of use, the line performs admirably. As I mentioned above, the Rio Gold comes in two color combinations: Moss/Gold and Melon/Gray Dun. I chose the Moss/Gold color combination. In the Melon/Gray Dun combination, the head is Melon and the running line is Gray dun.- casting competition lines - orange and white. wish is was white and orange. According to credible sources - white fly line would be the most stealthy of floating lines. There is a reason, a trout’s belly tends to be white or light. I wish that option was available. Over the past 4 years, I have owned three five weight Rio Gold lines. I have beat them to death and they perform...very well. For someone who fishes as often as I do, this should serve as an indication of my satisfaction and the durability of the Rio Gold line. DISCLAIMER: The Rio Gold WF5F Line tested in this product review were provided to me at no cost, but hold a retail value of $74.95. I currently hold no association with Rio whatsoever. As with this review and all future reviews, I will do my best to offer up my honest and unbiased opinion, good or bad.